Today is International Day Of Happiness and with Happy, Pharrell Williams unknowingly provided its unofficial theme song. Even by just reading about it, you will probably get the Oscar-nominated earworm stuck in your mind for the rest of the day. My apologies. But why are you reading about a Pharrell song on a David Lynch site in the first place? See, the single release of “Happy” was accompanied by a 24 hour music video starring random people dancing around Los Angeles and miming along while the song is repeated no less than 360 times. And some of the streets in one of the most cheerful videos ever… are the same streets walked by a terrified Henry Spencer in David Lynch’s cult classic Eraserhead! Years later, David Lynch returned to the same area for Wild at Heart. Count on former Twin Peaks Fest organizer and mightily hawk-eyed Jared Lyon to discover such things. It started while he was watching SyFy‘s Face Off and the main warehouse reminded him of a scene in Eraserhead. Looking it up, he found out they were filmed just a few hundred feet from each other. “Then I was watching Wild at Heart and noticed that same underpass that Henry walks through,” Jared continues. Back to the official four-minute edit of the Happy video, in which Jared noticed a location at 1:21 that also looked eerily similar to the one in Eraserhead. A little more searching, and I found out that during the “8 AM” section of 24 Hours Of Happy, people dance all around the same area! And then finally, I was just watching the Patton Oswalt episode of Jerry Seinfeld’s Comedians in Cars Getting Coffee web series, and saw a familiar coffee shop that is in the Happy video too. Here’s the long-form segment Jared is talking about. When Jared shared his discovery, my humble contribution was recognizing the same area from the Thunder Road car race in Grease. He went on to plot all the filming locations in order by Pharrell’s hours, camera angles and all. While doing so, he found out that while the video may say 8 AM, Pharrell’s shadow indicates it’s more like 4 PM. Hah! 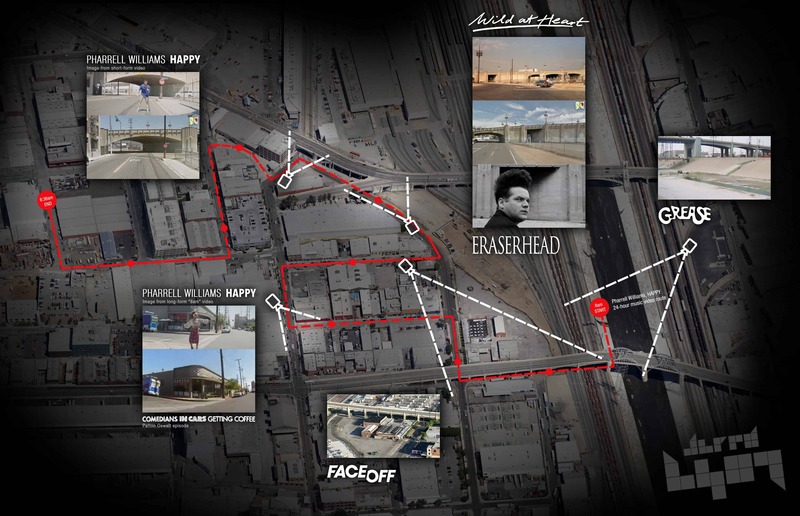 So… Happy, Eraserhead, Wild at Heart, Face Off, Comedians in Cars Getting Coffee and Grease. It’s all related! And there’s probably a lot more. Just let us know in the comments if you discover something else that was filmed on the streets of Eraserhead. Finally, here’s another David Lynch link for you: Julee Cruise and Pharrell Williams on the vocals in this Handsome Boy Modeling School track. Sorry, small nitpick: Pharell didn’t write Happy, Cee Lo Green did.